Add the watermelon cubes with 1 cup water in the blender and blend well. Strain the juice and remove the pulp. 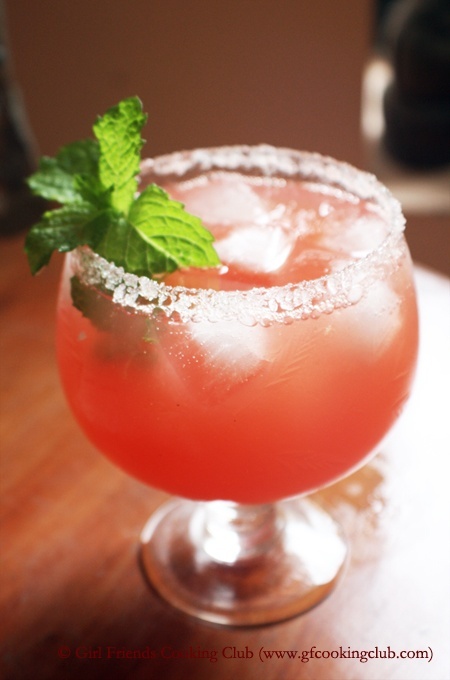 In a glass jar, add the watermelon juice, sugar syrup, lemon juice, ginger juice , black salt and mint leaves. Adjust the sweetness and salt according to your taste and put to chill in the fridge. When you are ready to serve, add the club soda to the watermelon juice mix and pour into ice filled glasses. Serve garnished with mint leaves and lemon wedges. This entry was posted in Drinks, Summer Cocktails and tagged Watermelon Soda Breezer by Kamakshi. Bookmark the permalink.